Picture in Scripture Amphitheater is a 1,000-seat outdoor amphitheater located in the hills east of Disney. Every summer, the amphitheater presents an original Biblical production, featuring a cast of 60 actors, exotic live animals, including Simon, the camel, state-of-the-art surround sound, pyrotechnics and stunning special effects. Bill and Linda Goldner, who founded the amphitheater in 1985, continue to operate the amphitheater and are still producing new shows, such as “Damascus Road: Where Saul Becomes Paul, the Greatest Apostle of All Times,” which debuted in July 2017. “Damascus Road” will be the feature production for Picture in Scripture Amphitheater’s 33rd season in the summer of 2018. The show will open June 29, and run every Friday and Saturday evening through August 4. 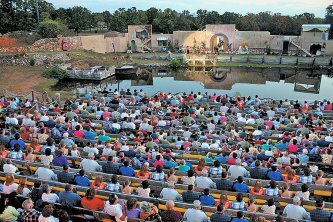 In the summer of 1985, the outdoor theater opened with its first production, “The Man Who Ran,” a dramatic presentation of the story of Jonah, Jesus and the great fish. That first production of “The Man Who Ran” was the start of a 20-year run. Thousands of people came to see the story of Jonah brought to life, sometimes with crowds of 1,500 packing the 1,000-seat theater. “The Elijah Factor,” the Goldners’ second production, was equally as well received. “The Elijah Factor” told the story of the prophet Elijah and his encounters with the wicked Queen Jezebel and King Ahab. It played at the amphitheater for more than six seasons. The Goldners are involved in every aspect of Picture in Scripture Amphitheater, from writing, producing and directing the plays to running the facility. Bill, who also acts in the productions, wrote “The Man Who Ran” and Linda, who directs the shows and works in the sound booth, wrote “The Elijah Factor” and “Damascus Road”. The soundtrack for productions at Picture in Scripture Amphitheater is produced by Scott Allan Mathews with SAMPmusic out of Tulsa. Depending on the production, the cast ranges from 60 to 80 actors, all of whom are from the Grand Lake area. The crew, which Linda Goldner describes as “a cracker jack crew that is really, really good,” are also comprised of local people. An evening at the amphitheater starts with dinner served in the pavilion. The menu includes charbroiled hamburgers, grilled chicken, barbecue and catfish, as well as light concessions, such as popcorn and cookies. All of the food is prepared on-site. Meals are served from 6:30 until 8 p.m. Youngsters and animal lovers can also visit the amphitheater’s petting zoo, which is open before every production from 6:30 to 8 p.m. For an extra fee of $3, visitors can go into the barn to see and pet exotic animals, including a zebra, kangaroo, ring-tailed lemur and two North African Sulcata tortoises. Simon the camel are housed in the barn, as well as several other animals from the production, including mini-horses and a donkey. A musical pre-show starts at 8 p.m. and the play begins around sunset at 8:50 p.m. The show runs approximately 1 1/2 hours. Tickets for the shows are $14.75 for adults, while children 10 and under are free. Walk-ins are welcome; however, reservations are encouraged. In the event of inclement weather, rain checks are issued if the show is unable to continue.